Peace Cereal sent me two of their products for review. 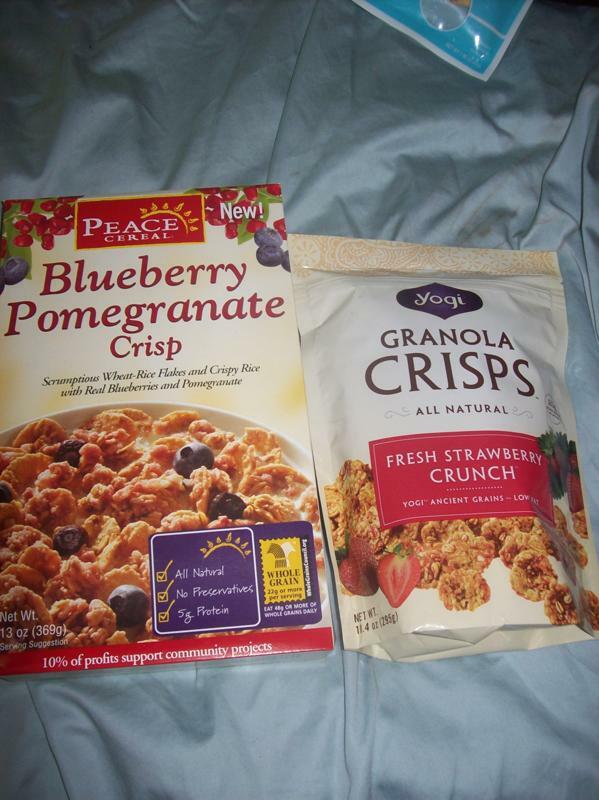 I got to try the Yogi Granola Crisps in fresh strawberry crunch and blueberry pomegranate crisp cereal. I ate the granola crisps plain as a snack and they were very tasty. They were sweet and crispy and would be good with yogurt too. They are full of grains and are low in fat. The cereal is very tasty too and relatively low in calories. You can purchase this cereal in the grocery store or online. This is how the company started: "Peace Cereal was introduced by Golden Temple in 1997 as a way to support a more loving planet. We believe change begins at the grassroots level, one person at a time. That’s why we support community projects that provide nutritious meals to those in need, through food banks and school breakfast programs. As a food manufacturer, if we can help alleviate hunger we believe we can start to create more peaceful homes, working and learning environments and, finally, communities." These products are very fruity and tasty! Thanks Peace Cereal for the samples! I'm including this on my grocery list this weekend. P.S. You may leave any question on my blog post if you like. I'd love to feature those who leave questions for everyone to answer. thank you for the great comment!! your blog is great!! i think i could learn a lot from you! !